The choice of peppers is yours, but unless the sausage is extremely mild, red bell peppers are always a good choice. For mild sausage, try Greek pepperoncini or other mildly hot pepper. 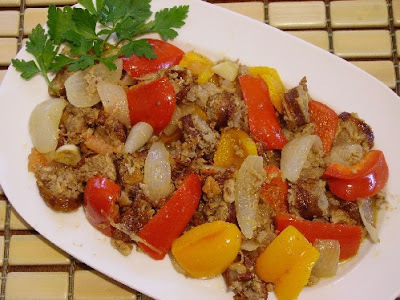 In this recipe, I used our local homemade sausage which has enough spice to make my eyes water, so I chose one red and one orange (sweeter) bell pepper. Cut sausage into slices. Peel onions and cut into chunks. Trim peppers and remove seeds. Cut into chunks. 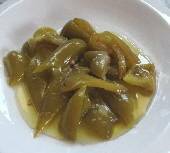 In a heavy-bottomed frying pan or skillet, sauté the onion in the olive oil over medium heat until translucent, about 5-8 minutes stirring constantly with a wooden spoon. 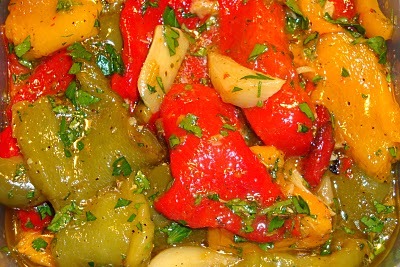 Add sausage, peppers, chopped tomato and juice, and garlic, and stir until all ingredients are well mixed. Stir in wine and cover. 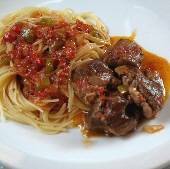 Cook for 20-25 minutes, stirring occasionally. Spoon onto serving plates and serve warm. If using pepperoncini peppers (mildly hot), they can be used whole as long as the sausage isn’t extremely spicy. Otherwise, slit the pepper open and remove the seeds before adding to the dish.